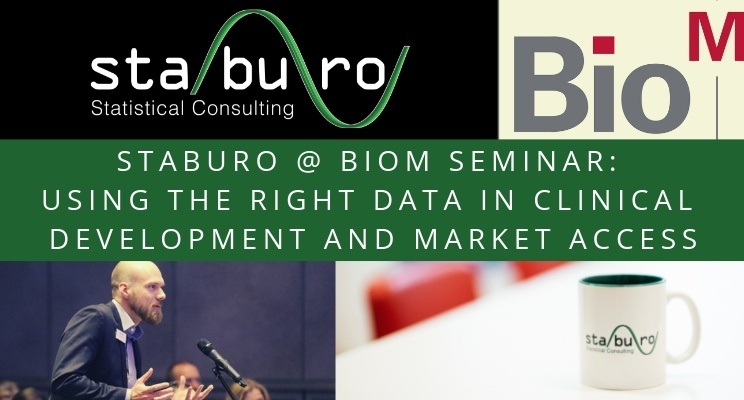 Staburo’s Managing Director Roland Stieger attended the BioM seminar with the topic “Using the right Data in Clinical Development and Market Access” in Munich. The main topic at this seminar was the future of Clinical Trial Designs, Real World Evidence Plus, further Market Access – study requirements and strategic insights in context of the patient related data to facilitate clinical development. Integrated, patient centered thinking may grant additional opportunities to develop better solutions faster in the clinical field. Speakers were Dr. Ute Simon, Medical Director at the Novartis Pharma GmbH, Dr. Timm Volmer, Founder from SmartStep Healthcare & Market Access Consulting GmbH and Dr. Reiner Lehmann, Founder from DontBePatient Intelligence GmbH. Novartis Pharma is one of the largest pharmaceutical companies. Novartis uses science-based innovation to address some of society’s most challenging healthcare issues. The talk was about the future of clinical development and the clinical trial designs. SmartStep Healthcare & Market Access Consulting provides individualized and specialized consulting for the pharmaceutical and medical device industry, in order to achieve a rapid and effective market access for their products. Dr. Volmer’s topic was the integrated Market Access planning with questions like how to obtain advice from HTA institutions. DontBePatient Intelligence generates Real World Insights derived from patients. Dr. Reiner Lehmann talked about how to identify and engage patients in the digital space and how to generate data to inform target population selection, trial design and choice of endpoints through patient derived information. We thank BioM for the organisation and the speakers for their expert insights! 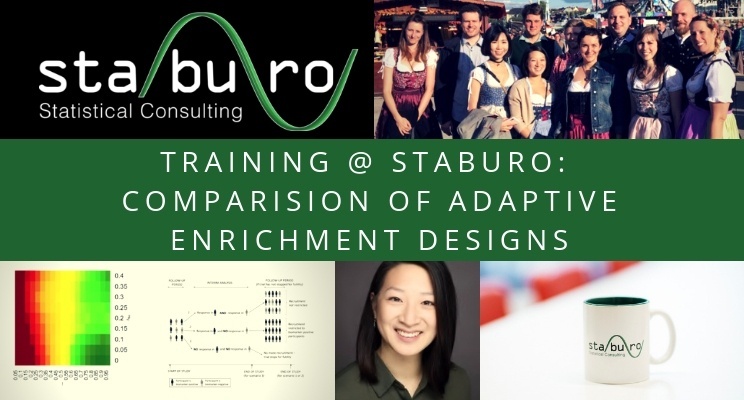 Due to the growing interest in personalized medicine, where patients receive individually tailored therapies, the application of adaptive enrichment designs becomes increasingly more important. In standard approaches, the confirmatory clinical trial is run in the full population and patients who are more likely to benefit are identified in post-hoc subgroup analyses. However, disregarding the heterogeneity in the treatment effect, can lead to an erroneous stop of the development, as the effect may be diluted by the low efficacy in the overall population. In situations with a prior confidence about a benefit, only in a subset of patients, a further option is to start the trial with a broad range of patients and to sequentially change inclusion criteria, based on the data of the ongoing trial. After pre-planned interim analyses, these so-called adaptive enrichment designs allow the further recruitment of only the targeted subgroup(s). Depending on the selection rule at the interim analyses, an early stop for futility is also possible. In case the first-stage data indicates a promising benefit only in the subgroup, the trial is enriched by allocating the remaining sample size only to this patient subset. If the interim data fulfills the selection criterion for all subgroups, the original study plan is maintained and the null hypotheses, regarding all subgroups, are tested at the final stage. In research, it has been shown that adaptive enrichment designs can obtain higher power than fixed parallel group designs or adaptive designs without enrichment, when the same sample size is used. Hence, adaptive enrichment designs are a meaningful contribution in the context of precision medicine. Staburo recently started a successful collaboration with OncologyInformationService – O.I.s)! 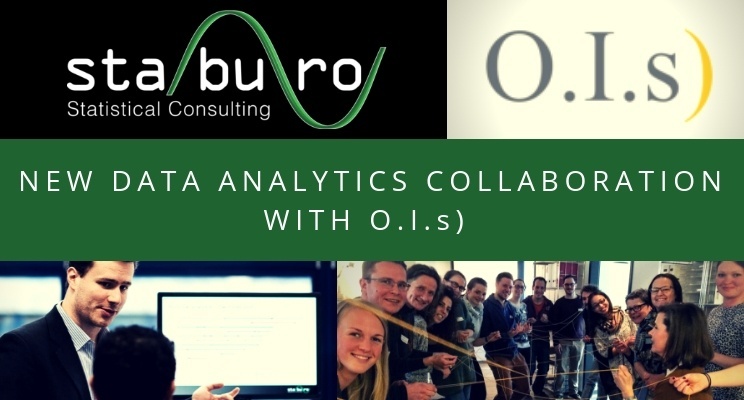 Staburo supports O.I.s) in the analysis of Real World Data in oncology. O.I.s) has been providing an innovative, proprietary and tailor-made methodology and expertise in the field of Real World Data for oncology and hematology for over 20 years. O.I.s) supports the majority of specialized pharmaceutical companies in market access and market development across Europe. In addition, the company and its founder Lenka Kellermann, are members of several medical associations, such as the “Deutsche Krebsgesellschaft” (DKG), DGHO and ASCO, bringing together patients, physicians and researchers into an environment designed to improve the outcomes. We are looking forward to a great sustainable cooperation! 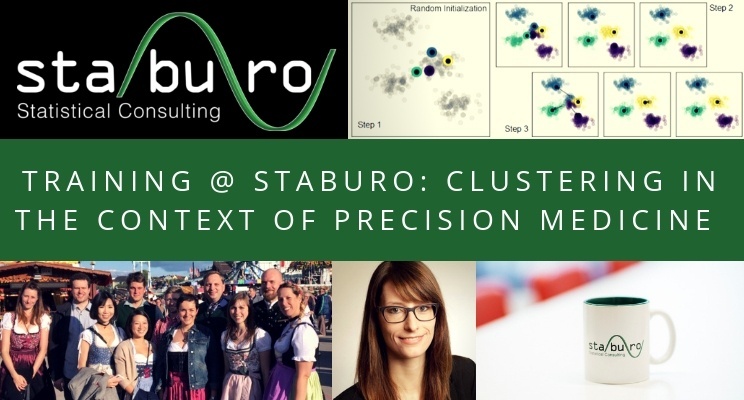 This presentation about clustering, differentiated between supervised and unsupervised methods, and introduced clustering as an important tool for subgroup identification, in the context of precision medicine and clinical trials. Precision medicine means tailoring the treatment to specific patient subgroups, i.e. patients characterized by specific genetic alterations, or similar biomarker profiles. Clustering, as an unsupervised technique for subgroup identification, groups patients e.g. based on similarities in biomarkers, rather than on a given knowledge, like tumor type. The importance of clustering for precision medicine and clinical trials was illustrated, based on two well-known examples of high clinical importance in oncology. Hierarchical clustering was used to identify several patient subgroups in gene expression data of breast cancer patients. Those subgroups are characterized by different gene expression patterns, as well as different prognosis, regarding clinical endpoints, e.g. overall survival. Especially the HER2 gene is now a well-established prognostic marker, associated with poor survival in breast cancer. The Consensus Molecular Subgroups in colorectal cancer are cluster-based subgroups with high clinical relevance, as well. Those subgroups were characterized by several expert groups, based on different supervised and unsupervised methods, e.g. hierarchical clustering, or partitional clustering with k-means, as unsupervised techniques. The experts identified 4 subgroups of which one is characterized by poor prognosis in patients with BRAF mutations and MSI. During this talk, the concepts of both hierarchical and partitional clustering with k-means, were introduced and illustrated based on mentioned examples.